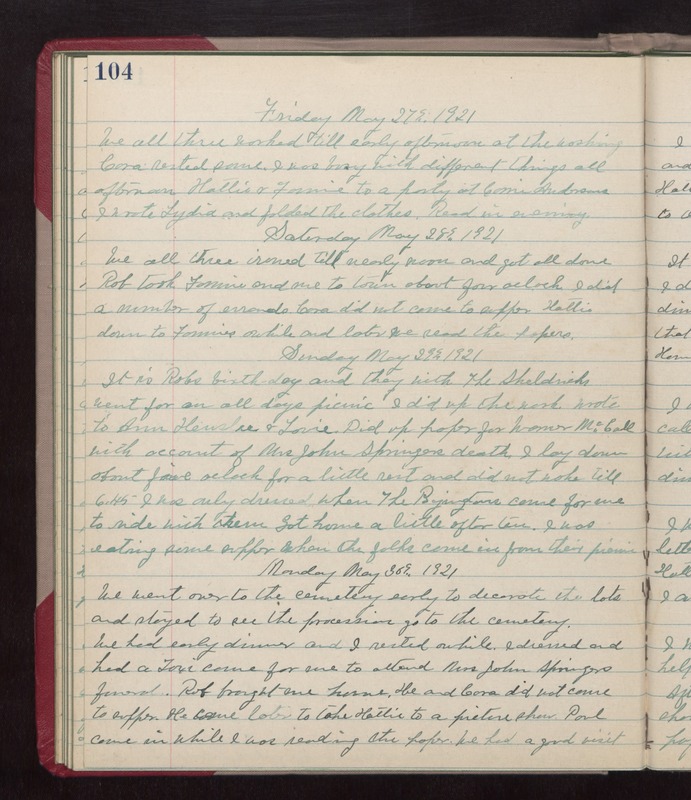 Friday May 27th 1921 We all three worked till early afternoon at the washing. Cora rested some. I was busy with different things all afternoon. Hattie & Fannie to a party at Corrie Andersons. I wrote Lydia and folded the clothes. Read in evening. Saturday May 28th 1921 We all three ironing till nearly noon and got all done. Rob took Fannie and me to town about four oclock. I did a number of errands. Cora did not come to supper. Hattie down to Fannies awhile and later we read the papers. Sunday May 29th 1921 It is Robs birthday and they with The Sheldricks went for an all days picnic. I did up the work. Wrote to Ann Henslee & Lorie. Did up paper for Warner McCall with account of Mrs John Springers death. I lay down about five oclock for a little rest and did not wake till 6.45. I was only dressed when The Byingtons came for me to ride with them. Got home a little after ten. I was eating some supper when the folks came in from their picnic. Monday May 30th 1921 We went over to the cemetery early to decorate the lots and stayed to see the procession go to the cemetery. We had early dinner and I rested awhile. I dressed and had a Taxi come for me to attend Mrs John Springers funeral. Rob brought me home. He and Cora did not come to supper. He came later to take Hattie to a picture show. Paul came in while I was reading the paper. We had a good visit.